Since 2006 North Korea has carried out a series of five underground nuclear tests on its testing site at Punggye-ri, in the north-east of the country. The most recent and most powerful of the tests took place on September 3 2017. Research into both the seismic and acoustic signals produced by the blast has yielded new insights. The research was carried out by Shahar Shani-Kadmiel, Pieter Smets, Gil Averbuch and Läslo Evers, together with Jelle Assink from KNMI. Part of the acoustic signals (also called infrasound) turned out to originate not directly from Punggye-ri but from sites many hundreds of kilometres removed from the test site. An analysis of the infrasound signals in combination with the seismic signals showed ground vibrations were produced as far afield as a river delta on the border of North Korea and Russia and undersea mountain ranges in the Sea of Japan. From these sites the vibrations had travelled into the atmosphere, generating infrasound. These findings will help the analysis and interpretation of infrasound measurement results from future nuclear tests, explosions and earthquakes. 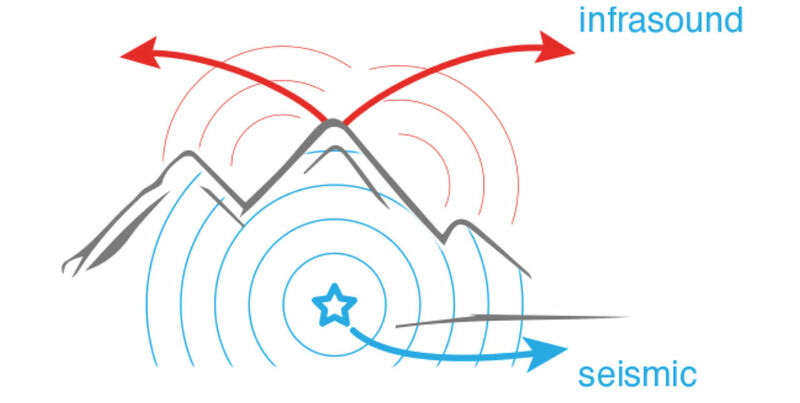 Seismic vibrations (blue) inside a mountain range produced by the explosion travel into the atmosphere and are detected as infrasound (red) at monitoring stations at a distance of many hundreds of kilometres. Map with the Punggye-ri test site in North Korea (star) and the infrasound monitoring station I45RU in the Russian Federation (triangle). The colours show the occurrence of seismic-acoustic coupling. This research, coupled with earlier research into the nuclear tests of 2013 and 2016, signifies an important step in the international research effort into infrasound. The previous research focused on determining the depth of the explosions. Seismic measurements can pin down the epicentre of a blast but are not as precise when it comes to depth and explosive power. The analysis of infrasound data enables scientists to determine depth with much greater precision. The present research gives a better insight into the origin of the signals, which travel via the earth to the ocean and into the atmosphere. Both research projects demonstrate the added value of combined seismic-acoustic analysis. Infrasound monitoring is an increasingly important technique for the verification of underground sources, such as nuclear tests and earthquakes. 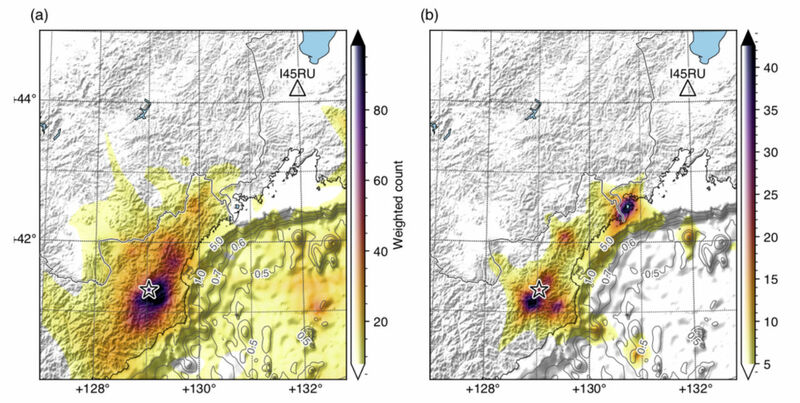 The paper on the latest research project can be found online in Seismological Research Letters and will be published in November 2018 in a special edition of the journal dedicated to the North Korean nuclear tests. The project was financed in part by a VIDI grant for Läslo Evers from Dutch research funding organisation NWO. The infrasound signals were detected at the infrasound monitoring station in the Russian Federation, some 400 kilometres from the test site. The station forms part of the International Monitoring System, which is used to verify the Comprehensive Nuclear Test Ban Treaty Organization (CTBTO). 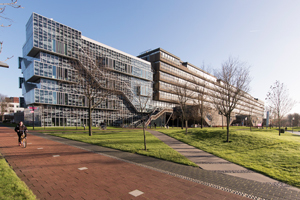 The KNMI is the designated National Data Centre (NDC) for the treaty and acts as an advisory body to the ministry of foreign affairs. The International Monitoring System (IMS) consists of seismic, hydroacoustic and infrasound monitoring stations. These monitor the earth, oceans and the atmosphere for signs of explosions caused by nuclear testing. The NDC analyses the KNMI real-time measurement data of the IMS stations.